January 26 1788. Very likely hot and humid. The First Fleet has moved into Port Jackson (Sydney Harbour) with the French not far behind and replacing it in Botany Bay. The Union Jack is planted ashore. Possession is declared and established by whatever it takes. It begins. I'd recommend Thomas Keneally's The Commonwealth of Thieves to anyone interested in this extraordinary establishment of a far off colony (equivalent to putting a colony on the moon these days some have said). Keneally recreates the first four years of settlement, the Philip years. Here's Kate Grenville's review, and she'd know a thing or two, she who wrote the marvellous The Secret River. So, we are stuck with what was once Foundation Day now being Australia Day and my sentiments are exactly these. If we must have a national day, then one day may it be Republic Day. Down here, I've doused the house in Banksias (such exotica that would take his name Sir Joseph wouldn't have found on the moon) and have decked one table with bark from the Scribbly Gums. 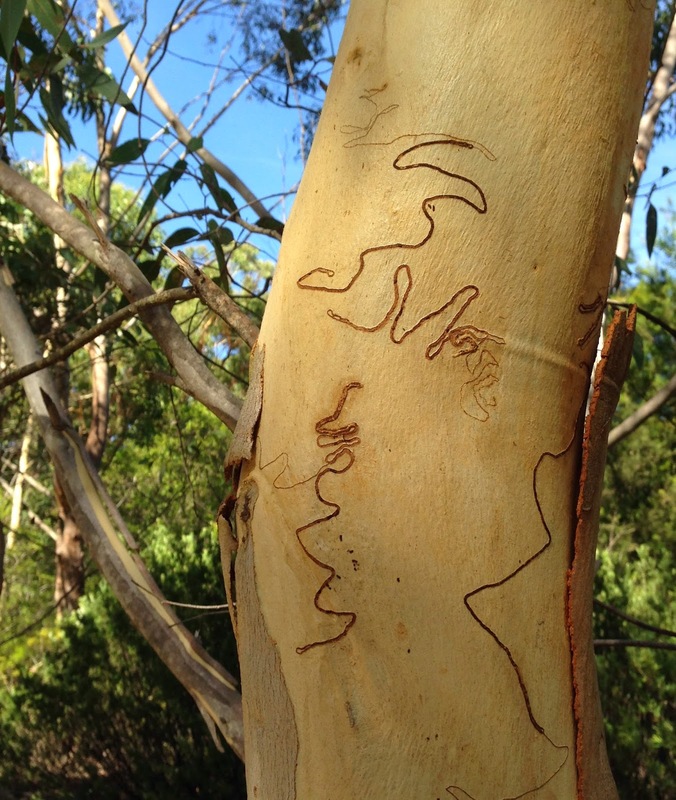 Scribbly Gums are things of wonder. They are Eucalypts. There's several varieties and particularly common are E haemastoma and E sclerophylla. I've planted heaps (I'm told by recent guests from NL that using this word collectively like this is an Australian pecularity, so on this day etc) of E sclerophylla. 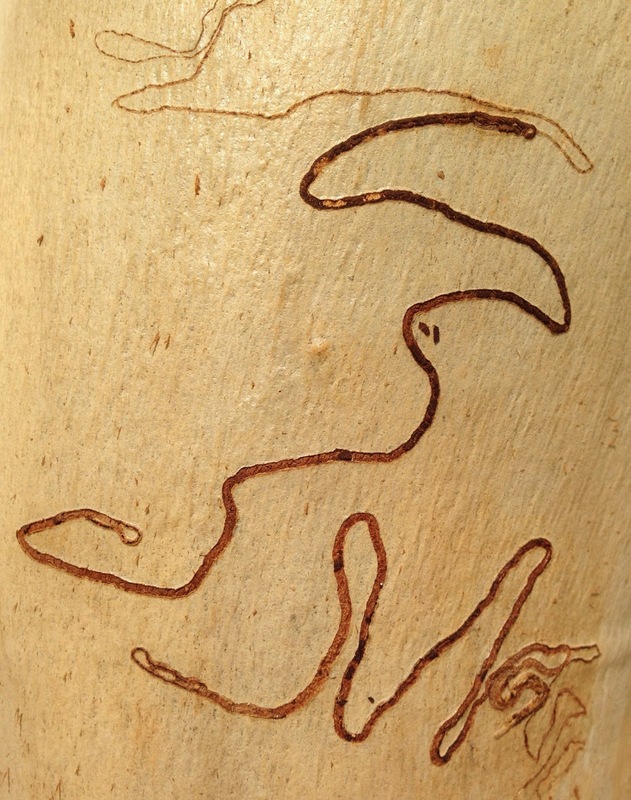 The scribbles are the wiggly lines remaining in the creamy white trunk when the bark peals off and these beautifully etched tracks are the paths taken by the larvae of the scribbly gum moth burrowing away under the bark wandering back and forth getting wider and wider from laid egg till pupation. 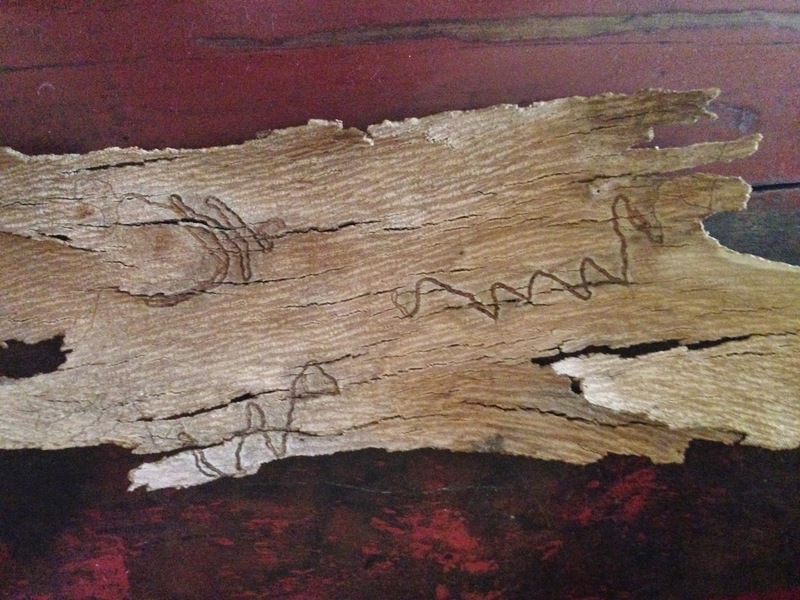 My Scribblies would be five or six years old now and just this last month have been shedding heaps of bark. I'd thought it might be the weather - hot with some heavy rains - but I suspect it is an age thing. An adolescence. 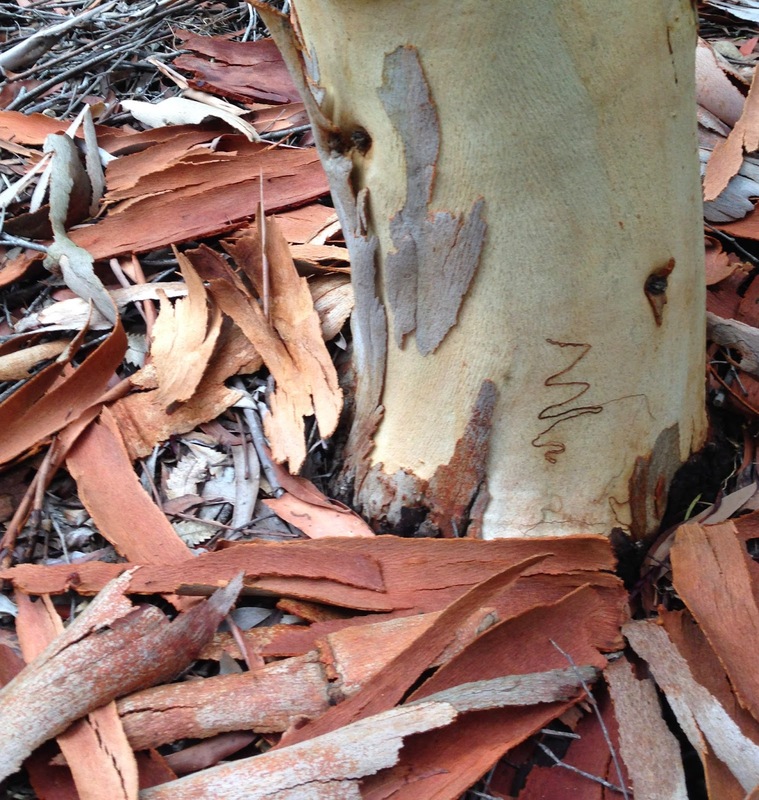 The markings are on both the bark and the trunk, and when you find a piece of marked bark, it is such a lovely thing that you think you might get it framed, or at least post it twice. I love seeing your down-under plants. the big brushlike cones? blossoms? on the Banksia are lovely and dramatic. 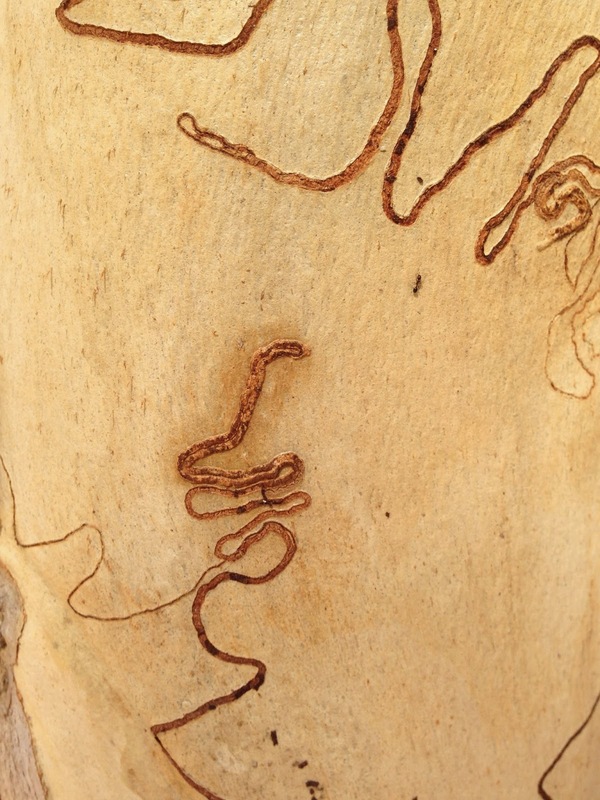 The Scribbly Gums have to be endlessly intriguing. One can't help but try to decipher a language in them. Susan, the 'cones', 'blossoms' are actually the flowers. They need to be seen in context really to be appreciated. I have only had time for a quick visit your way and have to say the Mahler 4 post is a wonderful resource exceptionally well presented. wanderer: I hope I will be able to see them "live" someday. I'm glad you thought the Mahler a good resource--that's what I hoped it could be. Brian has given--and continues to give--us a treasure trove of clearly presented information like this in our online musical discussion group, and just for the love of it. It's a beautiful thing!